One of my favorite things to do with my kids is to read books with them before bed. The really cool thing is that my daughter is old enough to get into some of the books that my dad and I read together. One of our favorite series to read right now is The Chronicles of Narnia by C.S. Lewis. 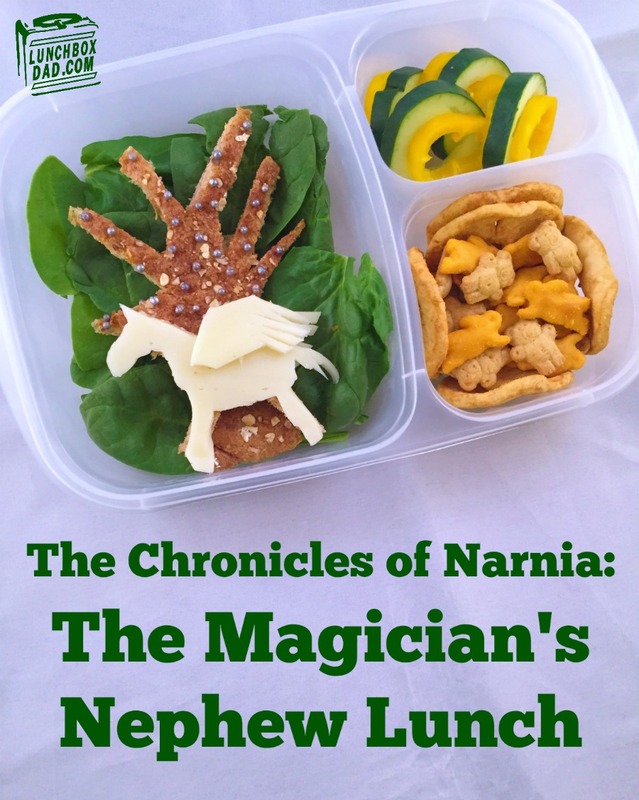 You may be remember my "The Lion, The Witch, and The Wardrobe Lunch" from awhile back. 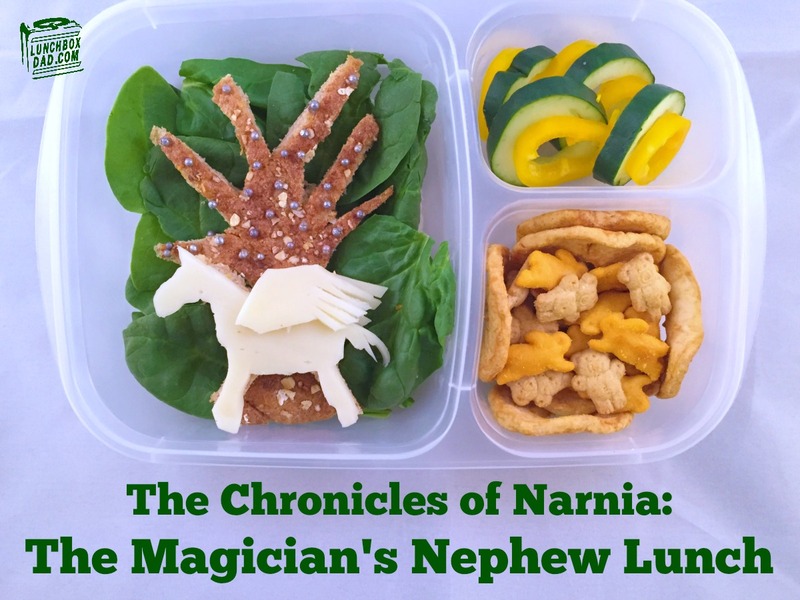 This weekend we finished The Magician's Nephew so it was obviously time to make another lunch from the series. This book is the prequel to The Lion, The Witch, and The Wardrobe and it describes the creation of Narnia. In this lunch you see one of the main characters, a pegasus horse, named Fledge. There is also the apple tree with the magic silver apples. In the side dishes are dried apples (for the apple tree), Teddy Grahams, and Annies Organic Rabbit Crackers. In the book you find Aslan creating all the Narnian animals so this was an easy decision. Lastly, I had to put in the famous green and gold rings made of cucumbers and yellow sweet pepper. I made this lunch in an Easy Lunch Boxes container. Remember to follow me on all my social media channels including Pinterest and Instagram! The buttons are towards the top corner of my site. Have a great week! 1. Cut tree shape out of the heel of whole wheat bread. Place turkey slice in the main container, spinach leaves on top, and tree on top of that. 2. Cut horse shape out of bread and another out of white cheese. Use cheese scraps to cut out two wings. 3. Place bread horse on top of tree. Secure with a toothpick if desired. 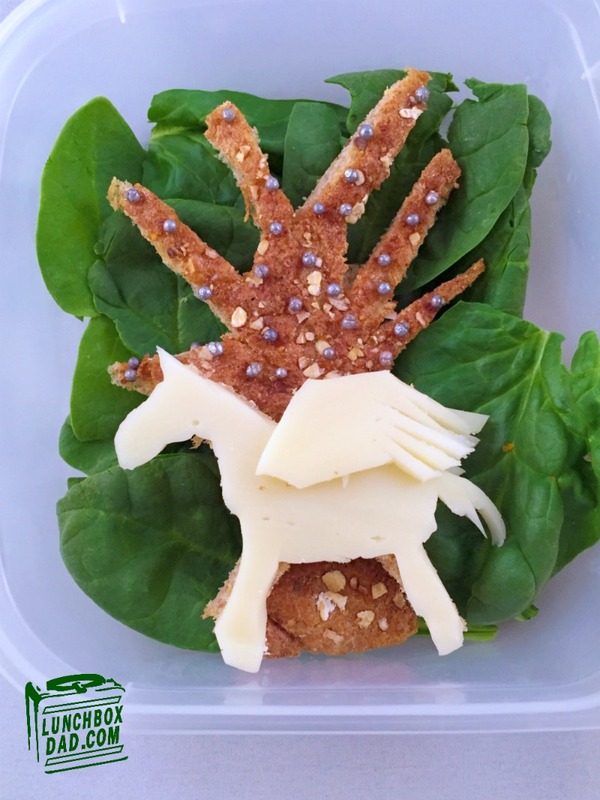 Slide one wing under bread horse and place the cheese horse on top of bread horse. Place second wing on top of cheese horse to finish pegasus. The cheese should stick together in the refrigerator. 4. Dip toothpick in honey and make little dot for each silver sprinkle. It sounds for detailed than it actually is. You can also use the toothpick to easily pick up each silver ball and place on the honey dot. The honey will glue the ball to the bread. The whole process only takes a minute. 5. In one side dish place yellow sweet pepper slices and cucumber slices with the middle cut out to form the magic rings. 6. In second side dish arrange dried apples, Teddy Grahams, and rabbit crackers. I do easy / simple bento boxes most days and some days of the week I do the more advance pretty lunch - My daughter really appreciates the effort and eats her lunch with minimal left overs. Yesterday, she actually put stickers on my hand and said "because you are a great mommy and make me great breakfast and lunch and dinner" (she is 6). Thanks for writing this. It's a good use of time Nicole! Keep on making fun memories Giovanna! Don't let the haters hold you down. I get it about the scraps. I try and use mine for other purposes as well. Lunchbox Dad, why do you let small mind people change what you like to do ?? Aint nobody got time to read comments from haters. Stop posting your personal stuff on facebook if you are so affected by it. Everyone got their own opinions, who are you actually going to listen to and please ? Wow, I just started following your blog and think your an inspiration. This is the first year for me making lunches for my daughter and while they don't look like yours, I get great ideas on how to give her a balance lunch. Thank you! Thanks for following, I'm glad you have found these ideas helpful and put them into practice! Don't worry, trolls can't get to me! don't stop showing your kids how much they mean to you, your kids are growing up with the MOST WONDERFUL memories of how much you LOVE THEM. nothing says your kids are special than a specially made BENTO BOX lunch that the OTHER kids will never get from their parents. who cares what other people think about your lovely & sweet gestures to your kids??? Our dad never made lunch for us, but I still remember lying in bed doing IQ tests with him. To this day, I consider logic problems fun rather than something to dread. Bless you both. Let sing together: "Haters gonna hate hate hate hate! Lunchbox Dad gonnaa shake shake shake! Just shake it off! Shake it off!". Let them be if it's gonna add a year in their life :D Let's bento everyday because it means a lot to our kids. Kudos to you Lunchbox Dad and to all of us who go the extra mile to make bento for our kids. well, as EDITH below said: Haters gonna hate! Go! Go! GO! Lunch box dad! continue to be an inspiration! I'm new here after reading the article on Huffington Post. I say the heck with the trolls. 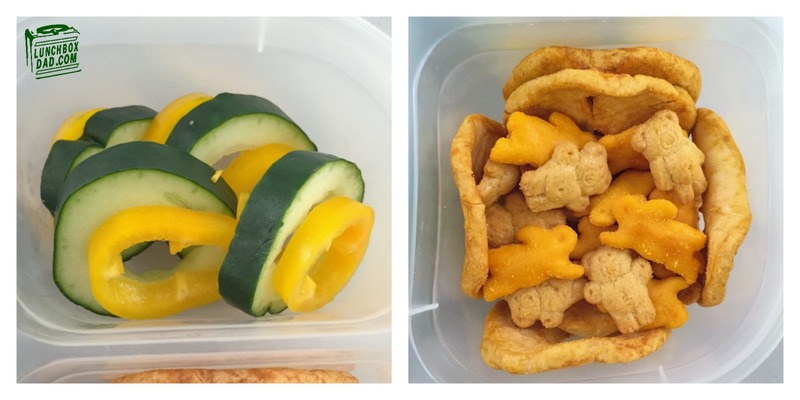 Now point me in the direction of how to make these adorable things for my kiddos lunch. Also a 'stay at home dad' who loves drawing on bananas for my kids. When not 'staying at home' I spend my time working 40 hours a week with a 2 hour commute. Building dens, drawing, reading stories, cutting eye holes out of cereal boxes and chasing my kids around also features heavily. The trolls are probably just watching their kids grow up over the top of their smartphones whilst being 'social'. Anyway, thanks for a new minion banana idea and keep up the awesome! Kudos my man, kudos! I would love to see more people doing that special something just to see their kids light up. If people would do the same and stay out of everyone else's affairs maybe the world's would be a better place. Stay at home mom here with a toddler. I make fun snacks just because all the time. Ants on a log, hit dog people, and she sees it giggles and then eats it. But I remember when I was a kid some of my favorite memories was centered around the kitchen. Helping my grandmother cook and enjoying a meal with my family and family friends around our kitchen table. So poo poo on the haters and love the sarcasm in this piece. Create those memories with your kids. And kudos again! Keep up the awesomeness!!! And remember gentle parents everywhere - we are raising adults, not children. What kind of adult do you want? I think Beau is on to something! Almost 55 years ago, my mom started writing jokes, riddles and cartoons, on bananas(peels). My friends were so jealous! I felt HONORED, that my mom made a special treat for me. I have passed this tradition on. Kudos to you, dad! Trolls should stay under a bridge and leave you alone. OMG. Loved this post. Good for you. Haters are gonna hate. But your kids know what is what. And you do too. Kudos to you. I think it awesome that you take the time to pack lunches for your kids. I am sure that having a bento lunch helps if they have had a rough morning. Your such an great dad. What ever happened to, If you have nothing nice to says...say nothing at all.